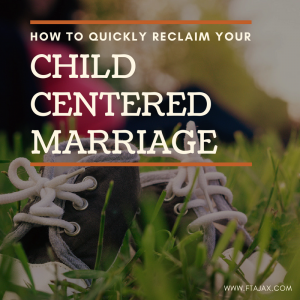 Lately, I’ve come to notice a pattern with couples who come into my office: one common theme I keep hearing is that one of the main reasons relationships are suffering is because they’ve evolved into child-centered marriages. Clients share that they feel that since they’ve had children, they’ve become more and more emotionally disconnected from their spouse, until they feel more like roommates than husband and wife. They realize that they’re dissatisfied and even lonely. They long for a more fulfilling relationship that more closely resembles the one that they used to have before children entered the picture. It’s understandable why this would happen – as a new mom myself, I know how demanding the role of parenthood is. Children take an enormous amount of our time and energy. Much of this is an unavoidable reality. Children are entirely dependent on us to care for them, keep them safe, teach them, and help them develop into fully-functioning, responsible adults. It’s a big job. Our culture, within the past couple of decades, hasn’t helped the situation: we seem to now be overcompensating for generations past that weren’t child-centered enough. When a child enters the picture, we suddenly feel enormous pressure to meet society’s definition of a “good parent,” which involves devoting an immense amount of time and energy carefully constructing the “perfect” childhood for our children, characterized by enriching activities that “ensure” they develop into well-rounded individuals (check out our article, How to Stop Being a Helicopter Parent). We’re expected to, at minimum, shuffle our kids to sports practices, science camps, and church activities, if not being active participants in them ourselves. In addition, I’ve noticed that many parents then tend to feel guilty for their children being so overscheduled, that they try to compensate by doing things for their children, such as household chores, that the children can and should be doing for themselves. However, according to prominent marriage researcher, Dr. John Gottman, “The sad irony is that in trying to create the perfect life for their children…parents fail to provide what kids need most – a happy home.” Children, above all else, need to feel secure. And one of the primary ways they feel secure is in knowing their parents’ relationship with each other is on solid ground. One of the best gifts we can give our children is a strong, healthy marriage relationship with our spouse. In doing so, we model for them what a mature relationship and a secure romantic bond look like. Also, we are happier, less-stressed individuals, which makes for a happier, less-tense home environment. Not to mention that our children aren’t meant to live with us for the rest of our lives; whereas, our spouses are. It’s crucial that you remind yourself of this. Think ahead to what you want your marriage to be like once your children leave home. Set boundaries around how many extracurricular activities your child can participate in at a time. This will probably be difficult – you may feel guilty. You may fear being judged as a “bad” parent by your peers. You may fear you’re setting your child up for long-term failure. Don’t worry – they’ll still get into college! All that fear-mongering going around about your child’s future being doomed if they haven’t participated in a multitude of extracurricular activities is actually false. Say no to doing your child’s chores and homework for them (notice I didn’t say to never help them with homework – but there’s a big difference between the two). Have them help around the house. Sure, when they’re young, it can be frustrating that they can’t do as good of a job as you can with any given task, but this is how they learn. You want them to get practice and develop a sense of competency, feeling prepared to take responsibility for their own property as adults. So with this one, you’re accomplishing two things: saving yourself time, energy and stress, while also empowering your children and teaching them to be responsible. Say no to making every free moment revolve around the kids: also hard. You may feel guilty that you don’t get enough quality time with them during the week, so you want to ensure your weekends are as jam-packed with kid and family-focused activities. Though these are important too, they can’t be the only relationships that get attention. Saying no to watching the kid-friendly movie together in favor of you and your spouse spending time together doing something more “adult” needs to happen regularly. When it comes to planning dates, whether that’s getting grandparents, or aunts and uncles on board, working out a child-swap date night plan with another couple in the neighborhood, or sacrificing daily Starbucks trips to set aside funds to pay for a babysitter, there are ways to work around the “who’s going to watch the kids?” question. Where there’s a will, there’s a way. When something’s important to us, it’s amazing the things we will do to find a way to make it work. Be affectionate with each other in front of your children. They may complain about how “gross” you’re being, but inside, it makes them feel good to know that their parents are in love with each other. It’s ok to admit that you can’t do it on your own. These issues are often very complex and difficult to navigate. If you’ve been stuck in a pattern of child-centered living for so long that you’re feeling hopelessly disconnected from your spouse, we are here to help you get back on track. Schedule couples therapy with us – it could be one of the best investments you ever make in yourself, your marriage, and also, your children. For more information, see our other article, Why Putting Kids First Can Kill Your Marriage.